I've seen so many movies about World War II that it's getting hard to really like a movie about the subject even if I have some affection for it. “The Book Thief” is based off a bestselling book that is critically acclaimed from what I've heard. Some people who I saw the movie version with told me that the book was far better and more complex. I always take this with a grain of salt since people say that about pretty much every movie adaptation even if the movie actually improves on the book. I do admit to being intrigued by the book though, so I hope it delivers on that promise. As far as the film is concerned it is competently made and obviously has a lot of love behind it, I'm just not sure if it's enough in this case. The story: Two children are given up for adoption because their mother can't care for them anymore. On the way over to their new family one of the kids dies, leaving the other one completely devoid of family. The surviving child is a girl named Liesel Meminger (Sophie Nélisse), a lovable girl who was raised so poorly by her birth mother that she can't even read. Her new parents agreed to take her and her brother to live with them for government subsidies, yet Liesel's new mother (Emily Watson) is upset one of the kids had died. She and her husband (Geoffrey Rush) were expecting to be getting wages for two kids as opposed to one. Now the money won't be substantial enough to keep them afloat, and on top of that they have another mouth to feed. Though her new mother comes off as a cold fish, her new father is much more welcoming and loving. He welcomes her into the family with open arms and even sets up the basement for her so that she can have her own dictionary that will cover the walls. Alas, blissful happiness is short lived as the German's go to war with Britain. We are told much of this by our narrator Death, who takes a keen interest in Liesel. Watching so much evil that human's do to each other maddens him, but he takes comfort when he gets to know a genuinely good person that lives in the world. His purpose for narrating the film isn't really clear. With the exception of one pivotal moment in the story, Death seems content to point out stuff that is happening on screen while we watch, as if we can't be trusted to follow the story ourselves. I wanted to pull him aside and tell him that it wasn't necessary to narrate as many of the events in the movie needed no explanation. By this point you may be wondering what “The Book Thief” is even referring to. It refers to the fact that the Germans hold a public book burning and Liesel has courage to take one of the books out of the fire. Does the fact that she does this mean anything? I suspect it means that she has enough wisdom to know that she's being robbed of history. What this has to do with the rest of the film is anybody's guess. The rest of the time she is keeping the fact that her family is hiding a Jew a secret, a story element that takes up too much time for a small payout in the end. 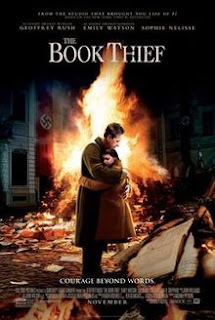 I brought up the novel earlier in the movie because “The Book Thief” feels incomplete. I was never bored by the movie and the acting is wonderful. Sophie Nélisse is a wonderful find as the title character, as she is instantly likable and has very real feelings. It's also nice to see established actors like Geoffrey Rush and Emily Watson still finding great roles this late in their career. When the film ended though I had this surprisingly empty feeling inside. How could something that was so interesting not leave a mark on me? Is it just the fact that I've seen too many stories about World War II and I feel like I'm going through the motions at this point? 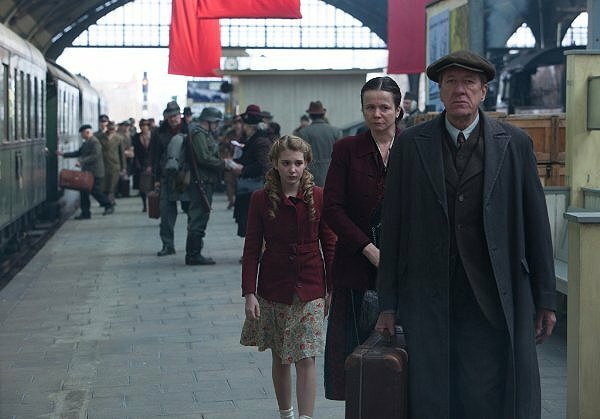 “The Book Thief” doesn't bring anything new to the table for what has now become its own genre. Why couldn't this film be more about the destruction of books and the Nazi's efforts for total culture control? That movie I haven't seen yet. Parents, there is some war violence and minor language, but otherwise acceptable for most ages. Recommended for ages 8 and up.